In the night of 5-6 June 1984 Gen Subeg (or Shahbeg) Singh was guiding the Sikhs defending Golden Temple. He was at Jhanda Bunga where two flags hoist in front of Akal Takhat and Darshani Deori. His planning was such that what ever troops came to Golden Temple through parikarma could not return back. Finally in the dead of night the army realised it was impossible to gain control over Golden Temple complex. Infuriated the Chief of Army Gen. Vaidya stated that the army could go to the extent of using atom bomb. 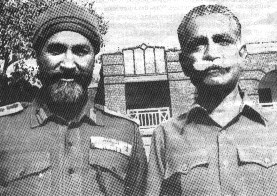 The fighting Command of Gen. Suderji and Gen. K.S.Brar then brought the tanks in the parikarma. 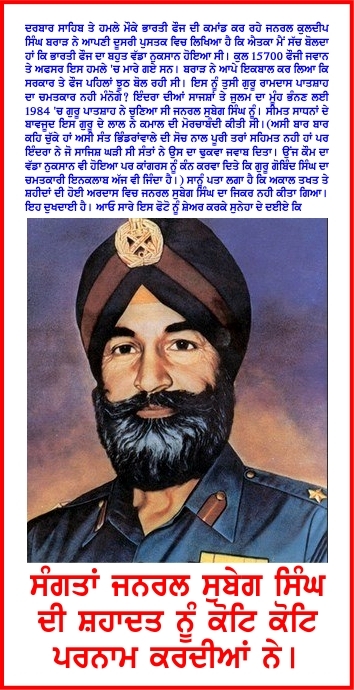 Gen. Subeg was guided the Singhs how to immobilize tanks with grenades. Then 2-3 bullets hit the General. The General realised his end was near and thus went to Sant Bhinderanwale at Akal Takhat to say good bye. He told how the parikarma was then full of bodies of the Army men. He said, it is victory to the Guru and that the world will know it. 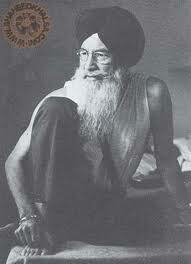 He informed the Sant that tanks were now brought in and we were left with only a few Singhs. He said, "I feel I have accomplished my duty and please pray for me now as I am departing." He wished the Khalsa will rule one day. He regretted for having served the thankless nation. 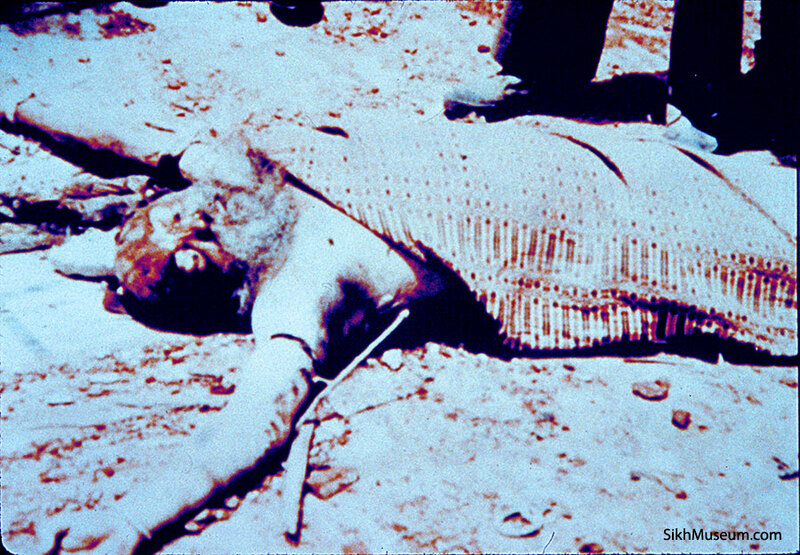 Profusely bleeding as he was, Bhai Amrik Singh helped him to lay. There he bid final goodbye with the greeting "Waheguru ji ka Khalsa, Waheguru ji ki Fateh". Please read the details in Punjabi. 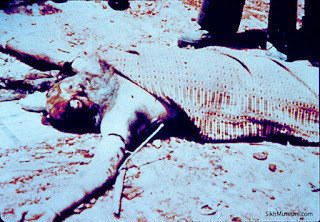 The next day his body was found from the basement of Akal Takhat sahib. My father resigned along with three other brigadiers because he felt he was unfairly ‘passed over’. One of his compatriots from his cadet days, General Arun Vaidya, went on to become Army Chief and ended up being killed by Sikh terrorists because they held him responsible for the attack on the Golden Temple. 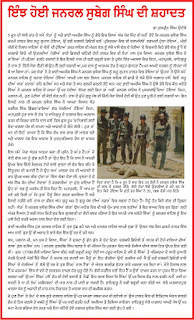 In that battle was another General who fought on the side of Sant Jarnail Singh Bhindranwale because of his bitterness against the way he was treated by the army and the government. General Shabeg Singh was helping Bhindranwale’s ragtag army build fortifications in the Golden Temple when I met him in the weeks just before Operation Blue Star. When I asked him why he was preparing to fight the very army that he had served with dedication for so many years, he said it was because false cases of corruption were made against him and he was dishonourably discharged a day before he was due to retire. As the man who helped create the ‘Mukti Bahini’ he was among the biggest heroes of the Bangladesh war, so the humiliation of his discharge was especially painful. General Shabeg Singh went to court against the army and won his cases and it was to give thanks for this that he came to the Golden Temple and met Bhindranwale. He was killed by his side on June 6, 1984. What I can say with certainty is that he would not have been helping Bhindranwale had he been treated better by the army and the Ministry of Defence. While reading the book "Operation Bluestar- Inside Story" penned down by Lt.Gen.K.S.Brar, my eyes are zeroed in on one character i.e.Maj.Gen.Shabeg Singh who fought along with Sant Bhindranwale against India army in the battle of Golden temple, Punjab, in 1984. I have made in detail study of his personal background on the basis of information available. It has just shocked me that this person during the course of his service in the Indian army, fought in every war that India particiaped in. 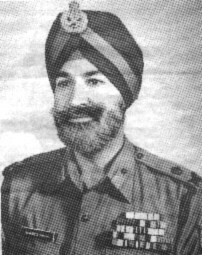 Maj.Gen.Shabeg Singh, AVSM and PVSM, was an Indian army officer noted for his service in training of Mukti Bahini volunteers during the Bangladesh liberation war. He also shaved his hair to maintain the secrecy, for this national cause which was against the principles of Sikh religion. Besides Hindi & English, he was fluent in persian, urdu, gorkhali. However, Major General Shabeg Singh was discharged from Indian Army without court martial one day before his retirement, thus losing part of his pensions.They didn’t give him any kind of trial. They threw him out under a special clause which has never been invoked in the British army and has been invoked in the Indian army only in his case. He was implicated in false corruption cases,& discharged from the service but courts cleared him of all charges. After retirement also he faced lot of humilation from the government, even he has no sufficient money to treat his wife for cancer. A monster of Sant Bhindranwale was created by Indira Gandhi to counter the influence of Akali Dal in Punjab, same was turned against her. Many times he was released on the orders of central government. 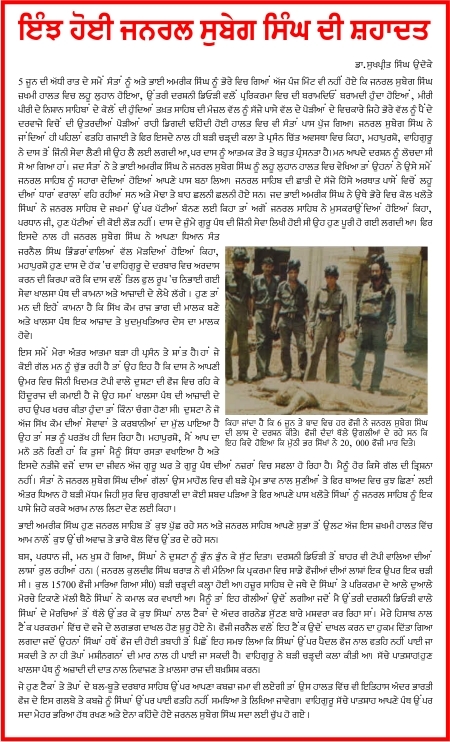 Bhindranwale has created the terror in Punjab with the help of Pakistan. It is very sad that national hero like Maj.Gen.Shabeg Singh has to face humilation & terrorist like Bhindranwale enjoyed the patronage of government. 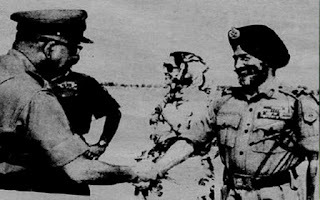 Maj.Gen.Shabeg Singh was killed in 1984,What I can say with certainty is that he would not have been helping Bhindranwale had he been treated better by the army and the Ministry of Defence. What General did in East Pakistan, he paid the same. the Indian Government and the dimwitted Indira Ghandi. As for General Shabeg Singh, I think he would have been at Bhinderwale's side anyway. The person who still remains on the loose end is General K. Brar, how he can justify his actions in a book explaining Operation Blue Star -a botch up job which was supposed to be a walk in the park but ended up being a fight to the death by a small group, is beyond understanding. I guess he should deal with his demons and stop calling himself a Sikh. I don't know why he does not become a Hindu since he played so well into their hands. It would give us Sikhs some solace that we have expunged ourselves of one traitor. We don't need you Sir. What a coincidence that Gen Brar was selected to kill Bhinderwale who was also a Brar. This is very sad commentary on Indian government under Congress. Shameful Hindus did what they did to the sikhs. No Sikhs there would be no Hindus.